Question of the Month - What exactly is a “starting point”? Having just announced our ministry name change, a natural question arises… What exactly is a “starting point”? The answer goes significantly beyond the obvious idea of “a place where you start”. When you think about it, everyone (whether they are a Buddhist, a Christian, an atheist, a Mormon, etc.) has to start somewhere with their belief system or “worldview”. It’s impossible not to start somewhere. One very important characteristic of a “starting point” is that it cannot be proven to be true. That may seem strange, causing you to wonder why anyone would pick something as their foundation which can’t even be proven. Let me shed some light on this. If you could “prove” whatever it is you have chosen as your starting point (let’s call it “A”), you would obviously be appealing to something else in attempting to do so (let’s call that “B”). So you say I know my starting point (“A”) is true, because of “B”. In this case, you are assuming that “B” is true in order to use it as “proof” of “A”. If you are first assuming “B” is true, that would be your starting point, not “A”. How do you know “B” is true? If you don’t really know and have no way of proving it, then “B” really is your starting point. However, if you say you know “B” is true, because of “C”, then “B” is not your starting point either, “C” now is. And so on and so on. Eventually, you get to a point where you can’t go any further down the line and you finally reveal your true starting point (the point which you assume to be valid, but can’t actually prove). Others would have a different starting point. This leads to a very natural question. What is their “starting point”? Most likely, they may not even realize they have one, but they would certainly agree with the premise that everyone has to start somewhere, including themselves. After some brief reflection, they may have a better idea of what their starting point is and can then share it with you. In return, you can ask what led them to choose that particular starting point, as well as why they feel it can be safely used to effectively and accurately define everything else. It is at this point great conversations arise. With a little training, you can easily expose the shortcomings and inherent problems with the starting point they have chosen and why it leads to contradictory and contorted results when trying to make sense of the world around them. We do this, not simply to win an argument, but to help lead them to the truths found in God’s Word, and we always want to do this with gentleness and respect (1 Peter 3:15). It’s always the Holy Spirit that does the heavy lifting… we just want to make sure we don’t get in the way, and being argumentative and condescending is not the way to effectively present Christ to anyone. We are to be ambassadors and should be winsome and above reproach. I know this article may raise more questions than it answers, but I will continue to develop these thoughts in future articles, since our space is always limited here. 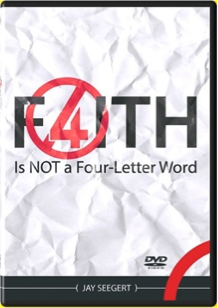 I would also highly recommend one of our DVDs if you haven’t already seen it: “Faith is Not a Four-Letter Word”. It more clearly explains these concepts with great graphics and powerful examples. It also graciously destroys the myth that skeptics are all about using facts to prove their views and Christians just have faith, which is nothing more than wishful thinking.